Waterman Law, P.A. has individual experience at both the trial and appellate level. The law firm’s familiarity with the history of decisions in the local trial and appellate courts is a distinct advantage in the presentation of cases before the reviewing court. In addition to the knowledge of the law, a successful appeal requires a detailed analysis of all aspects of the case. 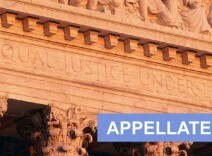 We have the resources necessary to manage your case throughout the appellate process. Our attorneys assemble a cost-effective team to respond to all types of cases before the Appellate Courts, including large, document-intensive appeals.